Massive oaks provide a background for this house that still stands at 1530 29 ½ Street. Located in the appropriately named W.E. Bailey’s Oak Grove Addition, which was platted in 1911, this and nearby neighbors date from the teens and twenties. Architectural styles encompass both single and two story structures as well as a wide variety of front facades. The two-story homes are typically American Foursquare in style, while others are bungalows, showing influences that range from Colonial Revival to Prairie Style. This Real Photo postcard was made between 1922 and 1926 when the home was occupied by Moore and Valeria Torrance. It had been built about 1920, and may have been rental for a time, as most of the early residents only remained a few years. Not until the mid 1940s did it gain long term owners, Raymond and Pearl Parmenter. Circa 1970, new owners, the Allen Otte family, began a long occupancy. Today the scene is nearly identical to that on the 80 year old postcard. Few changes have been made to this now historic house. Even the old growth oak grove near 16th Avenue between 25th and 30th Streets remains. Today’s roof shingles have a texture similar to the originals. Both chimneys are in place, although the bricks of the central one are now covered with masonry. Although not seen on the postcard, the brick exterior of the north chimney is exposed in a tapering stair step design. The stucco walls are intact as are the Prairie style details which emphasize the horizontal aspects of the house. Notice the masonry band that extends around the house beneath the windows and the design of the windows themselves. The front windows, as well as those near the back of the house, are set in bands of two or more, a typical Prairie characteristic. In front they are casement style, divided into tall narrow panes with even smaller panes at the top. Elsewhere, windows are double hung with the upper sash divided into vertical panes. The hipped roof with wide eaves was popular among Prairie architects, including Frank Lloyd Wright. This sheltering roofline emphasizes the horizontality of the structure. The porch still has unusual bracket-like structures at each corner of the front opening. They are very dark in color and, although present, are difficult to discern on the postcard photo. The only change to this home appears to be the addition of a deck adjacent to the covered front porch. This deck has replaced a former ground-level patio that was partially surrounded by a low stucco wall that can be seen on the postcard. 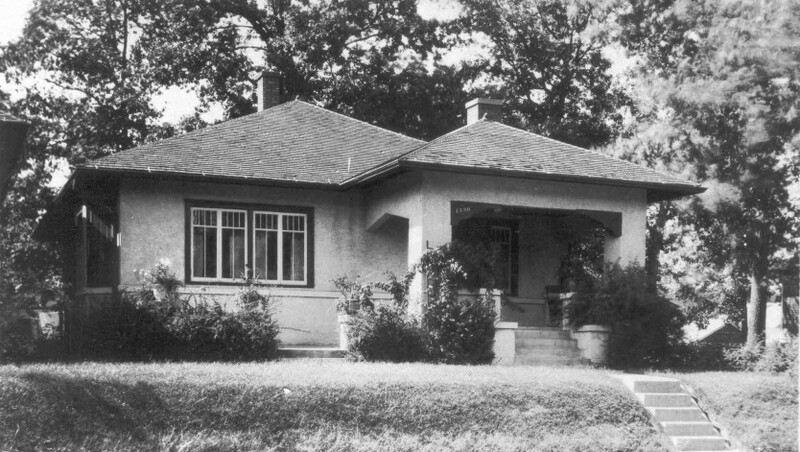 Stucco was popular for Prairie and Arts and Crafts styles. In this home, it has a very rough “pebble dash” texture. Although most of the nearby homes have clapboard siding, there are some other stucco homes in the immediate neighborhood. Because it is masonry, stucco is a very durable exterior surface. Not only is it fireproof, it resists wind and air filtration while permitting moisture to escape. When kept dry – no leaky roofs or plumbing and no plantings touching it – and free from mechanical damage — don’t bounce balls against it – a vintage stucco surface often looks as good as new. Even regular painting isn’t usually necessary for stucco. Original colors were those of natural cement sometimes lightly tinted in an earth tone. Although large cracks should be repaired to prevent moisture from causing further damage, fine hairline cracks are rarely cause for concern. If desired, they can be sealed using a Portland cement type paint, or even a slurry of cement and water, tinted if needed. A block to the south of our postcard home are two concrete block houses. Both are American Foursquare in style and are believed to be precut mail order or “kit” homes from Sears Roebuck. Sears and other American manufacturers sold these homes from the teens through the 1940s. They were delivered by rail across the nation. Although the concrete blocks in these examples were cast on site with Sears equipment, most mail order homes were frame construction. A popular source of precut kits locally was the Gordon-Van Tine Company of Davenport, which reportedly sold nearly 54,000 homes, compared to Sears 75,000. Other smaller companies were often located in the northern woods of Michigan. It was claimed that by using precision precut lumber a home could be erected in a fraction of the time it took to measure, cut and nail from scratch, and the result was of higher quality. Even the interior finishes, cabinetry, and light fixtures were optional parts of the mail order package. Although many mail order homes were constructed in the Quad Cities, few are identified, especially on the Illinois side. This article, by Diane Oestreich, is slightly modified from the original which appeared in the Rock Island Argus and Moline Dispatch on October 7, 2007.